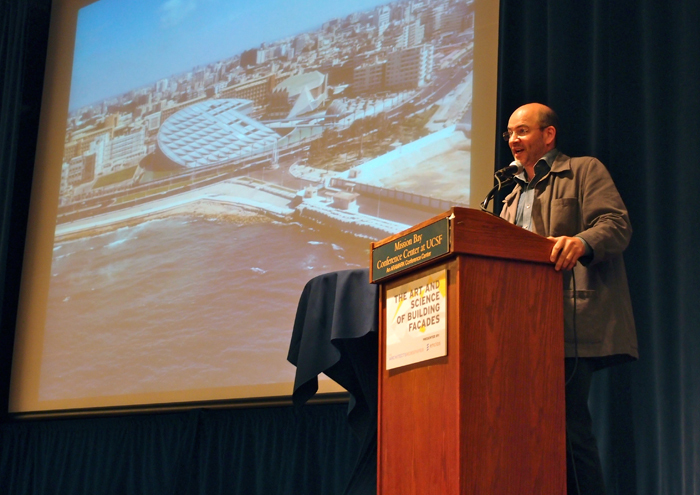 The West Coast edition of AN’s 2012 Facades Conference, “The Art and Science of Building Facades,” held at the UCSF Mission Bay Conference Center on July 26 examined the state of the art in building envelope design. The common thread: collaboration. The first speaker, Phil Williams, VP of Webcor Builders, set the tone by emphasizing early team integration in developing innovative design. Dennis Sheldon, CTO of Gehry Technologies, spoke on how their software facilitates a deeper and more integrated collaborative process between architects, contractors, and fabricating teams. Several consultants and fabricators were represented, including Enclos, Kreysler, Thornton Tomasetti, Front, Element, Seele, Cambridge, and Firestone, who similarly called for early input into the design process. Academic innovators in fabrication and parametrics included Jason Kelly Johnson and Andrew Kudless from CCA, Lisa Iwamoto from UC Berkeley, Chris Lasch from University of Arizona, and Marcelo Spina from Sci-Arc. The highlight was keynote speaker Craig Dykers of Snøhetta, who presented projects ranging from their Alexandria Library in Egypt to the upcoming addition to SFMOMA. Dykers touted the idea of reversing the conventional design process, using a “geological approach—materials before form.” He also emphasized the importance of talking to others in fields outside of architecture, long before any lines are drawn. The third segment in AN’s Facades Conference will take place later this year in Chicago.